Boggy Creek Airboat Rides - Kissimmee Florida - Imagine gliding through the wetlands viewing Florida's Native wildlife. Starting with a leisurely idle down our natural canal, looking for exotic birds, turtles and the Florida alligator. 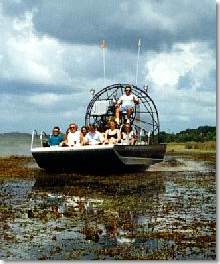 Imagine flying like the wind into the swamps experiencing the awesome feel of the airboat ride traveling in speeds up to 45 miles per hour. Imagine this unforgettable journey right here in the Orlando attraction area at Boggy Creek Airboat Rides because we are... "The Central Florida Everglades" If you are looking for a real vacation pleasure, then Boggy Creek Airboat Rides is your Central Florida destination. We are one of the best attractions for visiting native wildlife in their natural habitats. You might even see a few surprises along the way. You will quickly discover why everyone wants to experience our 1/2 hour guided tour. Our adventure into the wetlands of Central Florida offers you a sensational close-up view of towering Cypress trees, natural wetlands and wildlife. On each ride you'll have the opportunity to experience soaring eagles, osprey, snakes, turtles and Florida alligators. You will also enjoy the excitement of whisking across the surface of the water at speeds up to 45 MPH while shooting between walls of tall grass. This is fun experience for anyone of any age! Our tours leave every thirty minutes, 7 days a week between 9:00 AM and 5:30 PM, all year round. You can also visit us on any holiday because we keep the tours going. We accept cash, travelers checks and credit cards ( Visa, Master Card, American Express). We have two great locations minutes from the attractions. We do suggest you bring your sunscreen and sun glasses because the glorious Florida sunshine can take its toll on those of you not use to it. You will also want to bring your camera or video camera to capture beautiful pictures that will last a lifetime. We provide hearing protection and life jackets for everyone who goes on one of our tours. If the weather does dip below 70 degrees you may want to bring some warmer clothing. Racing across the water is sometimes pretty cool. Our tours are safe and fun for all ages. Not only are our captains knowledgeable about the area and wildlife, but all of our captains and first mates have many years of experience in airboating. We have only U.S. Cost Guard Master Captains and Coast Guard inspected vessels. Some of our captains are even retired navel officers. Ahoy mates!! As far as our machines go, we have one of the safest airboats built in the state of Florida. All of our boats are new and modern and they can seat up to 18 passengers. The boats are inspected daily for safety by our mechanic who is A&P certified by the Federal Aviation Authority.